EIT Climate-KIC is a Knowledge and Innovation Community (KIC), working to accelerate the transition to a zero-carbon economy. Supported by the European Institute of Innovation and Technology, we identify and support innovation that helps society mitigate and adapt to climate change. We believe that a decarbonised, sustainable economy is not only necessary to prevent catastrophic climate change, but presents a wealth of opportunities for business and society. We bring together partners in the worlds of business, academia, and the public and non-profit sectors to create networks of expertise, through which innovative products, services and systems can be developed, brought to market and scaled-up for impact. We identify, source and place public and private funds that stimulate innovation. We track progress and outcomes and draw out learning and insight so that our funding partners can effectively invest their resources for maximum impact. By bringing together those with vision, with ideas, with low-carbon products and services, and with finance, we generate the critical mass needed to tackle climate change. We catalyse and nurture innovation, whatever its source: from large corporations, research institutes and public bodies, through to start-ups and individual entrepreneurs. We encourage fresh new thinking from beyond the mainstream through initiatives like our 24-hour hackathon Climathon, or our cleantech ideas platform Climate Launchpad. Our incubator programme, Accelerator, gives seed funding, structure and assistance to start-ups and SMEs. We drive innovation in established organisations through our range of innovation programmes, specifically for our partners. Climate change is a wicked problem. It runs counter to almost everything that human beings are wired to respond to effectively. Keeping global temperature rise below 2 ˚C necessitates unprecedented change – new social dynamics, new ways of doing business and operating markets, capital flows, policymaking, new economic models, and new ways of living. Innovation can unleash the swift and effective change needed to address climate change. Taking a systemic approach across technology, infrastructure, economic models, capital flows and policy, can locate the necessary levers to turn innovation into climate action. EIT Climate-KIC and its world-class partners are working to make this change happen. We are united in our aims to deploy innovation where it is most needed for deep decarbonisation – the elimination of fossil fuels, negative carbon – and effective adaptation. Together we are working to create a prosperous, inclusive, climate-resilient society founded on a circular, zero-carbon economy. We help partners to influence key drivers of change — behaviour, governance, policy, finance, technology, market structures and information — by offering seed funds and grants off which they can leverage, building capacity and skills among leaders, providing the platforms needed for knowledge exchange and a neutral point around which stakeholders can coalesce and convene. Experimentation and learning are crucial to fighting climate change. 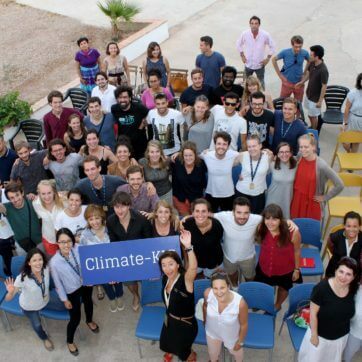 EIT Climate-KIC strives to inspire its community of alumni, partners and professionals to convert ideas, activities, experiments and reflections into action. We invite you to work with us to convert those actions into a movement.